My daughter just finished her first year of preschool. 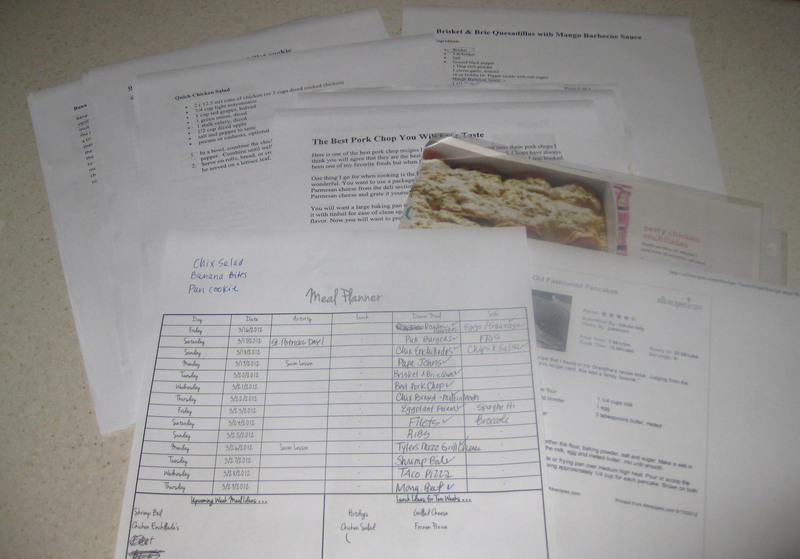 I saved a few of her projects and have been trying to figure out how to preserve her school work. I have taken digital photos of many of her projects, but I wanted to save some originals, too. These crates are perfect for saving your child’s projects, artwork, report cards, awards, class pictures, etc. 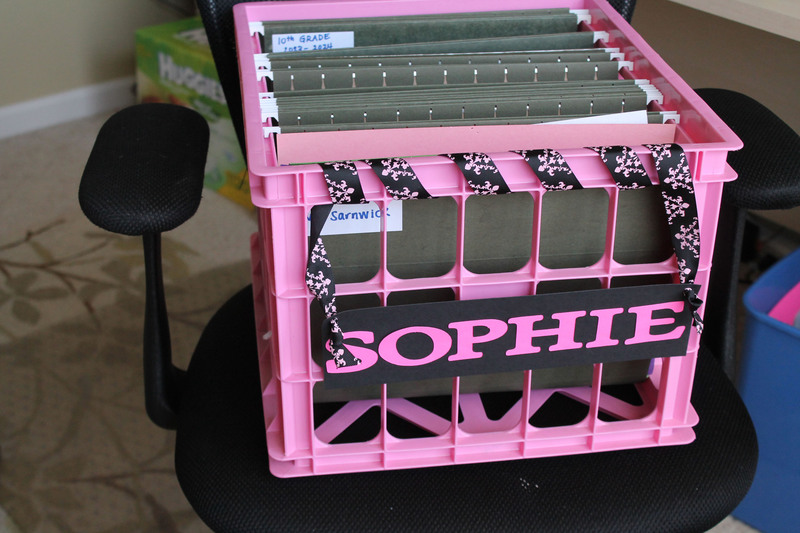 I found Sophie this pink crate at the Goodwill store for $1.50! I had the rest of the supplies on hand, so this was a super inexpensive project for me. I’m storing it in Sophie’s closet. 5.) School work, papers, report cards, class pictures, awards, certificates, etc. Project – It’s a very simple project. First, hang file folders (one for each grade). 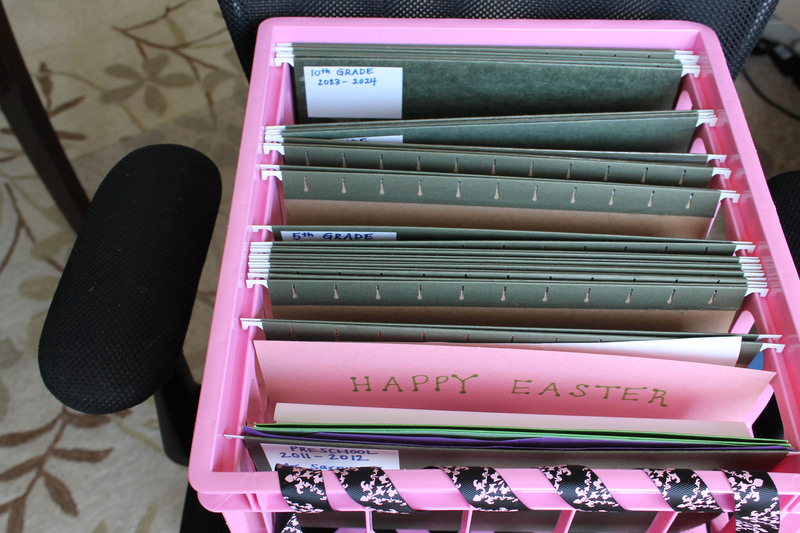 I ended up with 15 folders (2 years of PreK, Kindergarden, and 1st thru 12th grades). On each hanging folder, I placed an address sticker on the outside. I labeled each folder like this…. I will fill in each teacher’s name as the years pass. Then, I placed Sophie’s papers in the first hanging folder. I cut out her name (in pink) on my Cricut and glued it to a black piece of cardstock. Then, I used some leftover ribbon to affix her name to the crate. Isn’t it pretty! 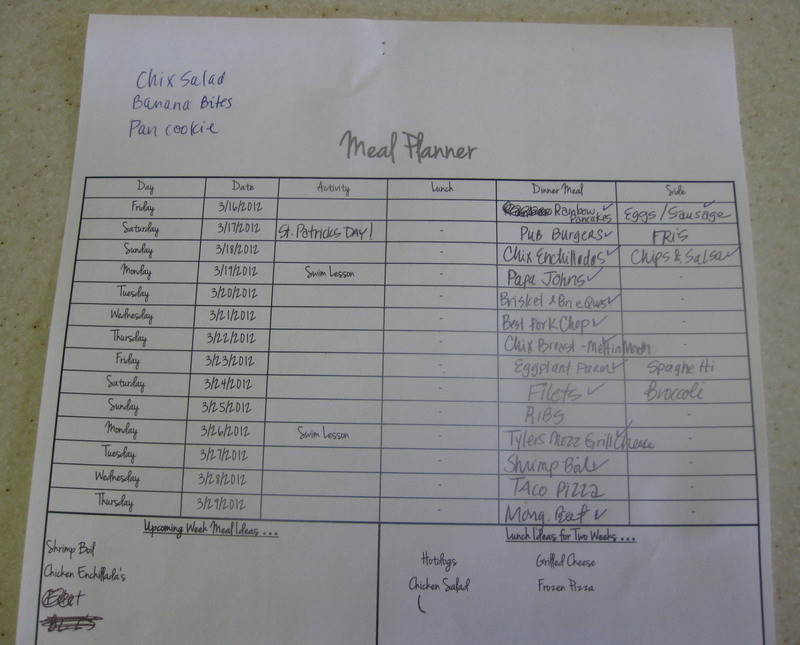 Substitutions: I’m going to create an interview sheet to stick on the front of each folder. I will interview Sophie the first day of each school year and place her answers on the file folder. I think it would be nice to add her school picture on the folder, too! The second bathroom (the first was the Tic Tac bobby pin storage) pin I created is this awesome looking makeup brush storage vase with marbles. It looks really cool and organized! 2) Marbles / Stones / Etc. 3) Makeup brushes, eye liner, mascara, etc. I purchased a small shallow vase from Hobby Lobby. I already had some blue/white/green colored “marbles” that I purchased from IKEA, so I used those. Ideally, I would have smaller sized round marbles, but FREE is better for now! I placed the “marbles” in the vase and then placed my makeup brushes in the vase. At first, I filled the vase to the brim with the marbles, but as I added my makeup brushes, the marbles spilled over. Overall, it’s a cool decoration for my bathroom and easy to reach for my brushes, but the marbles seem to spill out. Maybe if I spend some $ on smaller round marbles, I wouldn’t have that problem! Bobby Pin Storage – Tic Tac Container – Great Idea! I de-cluttered my bathroom this week and remembered a few pins I wanted to try out. The first pin I saw was a Tic Tac container used to store bobby pins. When I need a bobby pin, I find myself searching the back corners of my bathroom drawer. I knew this project would be fast, easy, and helpful! I’m happy to report that the Tic Tac bobby pin storage is a success. The bobby pins fit perfectly and they slide out easily! 1) An empty Tic Tac container with label removed (I already had one left over from my pretzel duck project). All I did was cut a piece of scrapbook paper to fit around the Tic Tac container. I used double sided tape to affix the paper. Then, I added bobby pins. Done and Done! Substitutions: I just added some scrapbook paper to jazz it up a bit. Time: 10 minutes or less!